The new DVR Remote Scheduler allows any IP or Fiber customer with a DVR box to schedule and manage their DVR from the web or a smartphone app. Click here to learn how to start using this great new feature today! 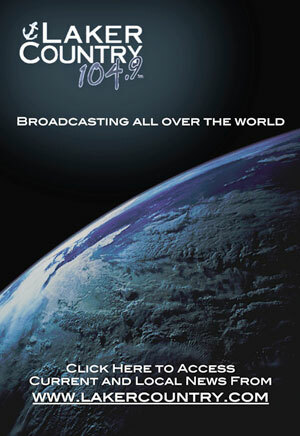 Duo County is proud to announce the newest channel in our great lineup of sports programming. In addition to local high school and college sports on Duo2 and 20 dedicated sports channels, the SEC network will keep you entertained with all the best action in the Southeastern Conference. The Southeastern Conference and ESPN have signed a 20-year agreement through 2034 to create and operate a multiplatform network which will launch in August 2014. The new network and its accompanying digital platform will air SEC content 24/7 including more than 1,000 events in its first year. The network will televise approximately 45 SEC football games, more than 100 men’s basketball games, 60 women’s basketball games, 75 baseball games, and events from across the SEC’s 21 sports annually. Programming will also include studio shows, original content such as SEC Storied, spring football games, signing day and pro days coverage. Hundreds of additional live events from various sports will be offered exclusively on the digital platform. 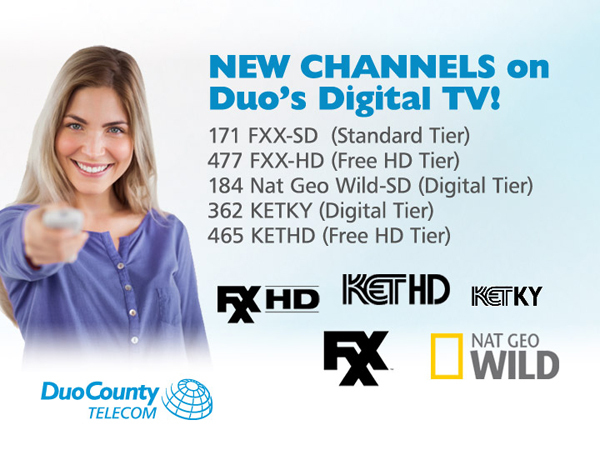 Duo County has added more channels to our lineup, bringing you more entertainment and more value! On our Standard Tier, enjoy award-winning original television on FXX, like It's Always Sunny in Philadelphia and The League, in both SD and HD. On the Digital Tier Nat Geo Wild brings you exciting shows like Alpha Dogs and Animal Fight Night. The new KET KY channel features a wide range of programming by, for and about Kentuckians, while KET-HD offers High-definition and widescreen programming from PBS during prime time. If you're not already a DuoTV subscriber. Call and switch today! Pictured left to right: Carla Perkins, Adair County Schools Director of Technology: Alan Reed, Adair County Schools Superintendent: Thomas Preston, CEO of Duo County Telephone Cooperative: Joseph Sparks, Duo County Telephone Cooperative Board Member. 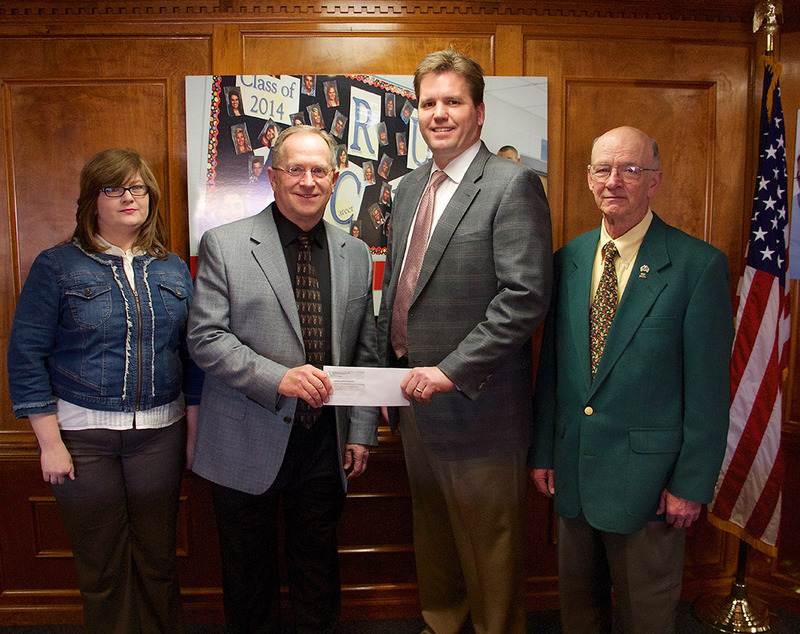 Columbia, KY – February 12, 2014 – Duo County Telecom announces a donation of $25,000 to the Adair County school district for technology upgrades. The school district welcomed the much needed funds as they are constantly facing the necessity to upgrade their technology infrastructure with limited resources. Superintendent Alan Reed was excited about this commitment from Duo County. “Our school district, just like so many others, experienced massive budget cuts over the past 18 months. Every instructional program was adversely impacted due to those cuts. Technology has been no exception. Duo County Telecom, one of our most important regional industries, recognized that student learning is directly tied to their ability to access and use current technology. I cannot begin to explain how thrilled I was to learn that they are committing monetarily to our system and its students at such a critical time. This will affect the lives so many Adair County students and, in time, the local economy." Directory of Technology for Adair County School District, Carla Perkins commented on the donation. "Many thanks to Duo County Telecom for the very generous donation of $25,000.00. This donation will be used to match technology funds that are currently held in escrow for a total of $50,000.00 to be spent for technology. Specifically, funds will be used to upgrade computers and to purchase other technology for student use." PLEASE NOTE: Equal donations made to other school districts within our service area. 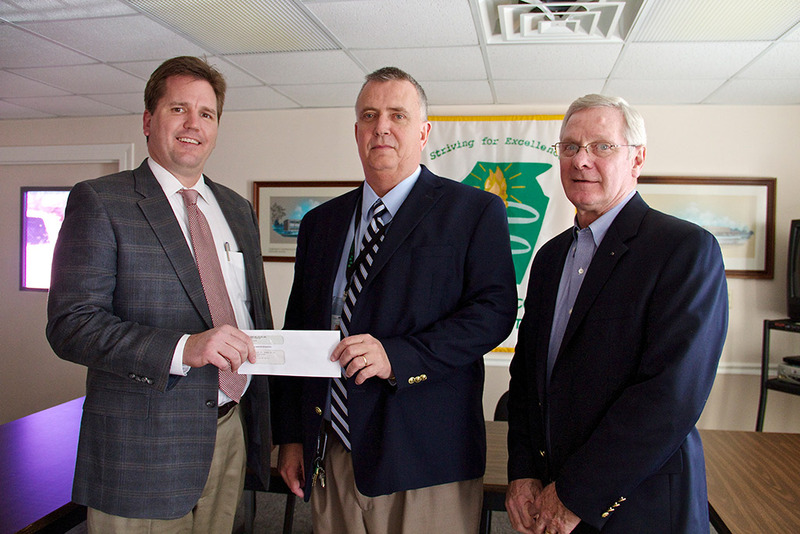 Burkesville, KY – February 12, 2014 – Duo County Telecom announces a donation of $25,000 to the Cumberland County school district for technology upgrades. The school district welcomed the much needed funds as they are constantly facing the necessity to upgrade their technology infrastructure with limited resources. Pictured Left to right: Chris Bell, District Technology Coordinator: Julie Beckmann Russell County School Board Chair: Michael Ford, Russell County Schools Superintendent: Thomas Preston, CEO of Duo County Telephone Cooperative: Dr. James E. Monin, Duo County Telephone Cooperative Board Member: Sharon Hill, Duo County Telephone Cooperative Board Member. 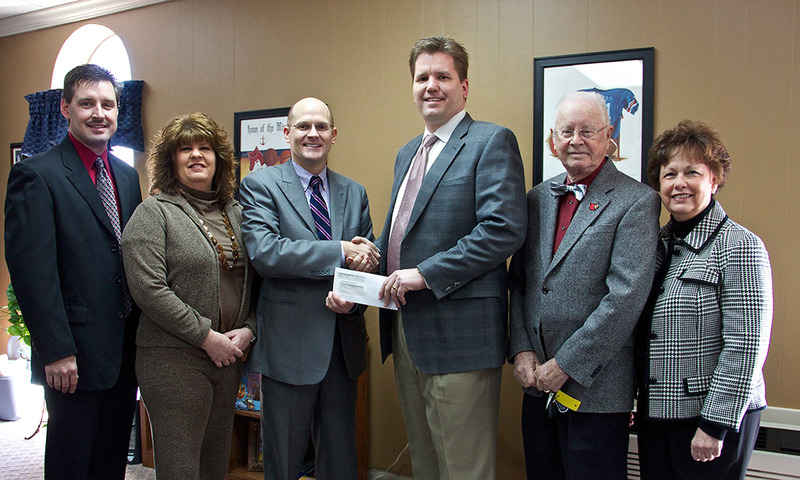 Russell County, KY – February 12, 2014 – Duo County Telecom announces a donation of $25,000 to the Russell County school district for technology upgrades. The school district welcomed the much needed funds as they are constantly facing the necessity to upgrade their technology infrastructure with limited resources.